The primary feature of this article is the video review above. In a market of 6 to 8 hour gameplay experiences, there’s nothing better than sinking large amounts of time into a slow simulation game. But it’s one thing to sink hours into a game one day, it’s another to come back the next day and do the exact same thing. To come back to the same game and play for extended periods of time takes something very special. Something that Haemimont’s Tropico 5 most definitely has. 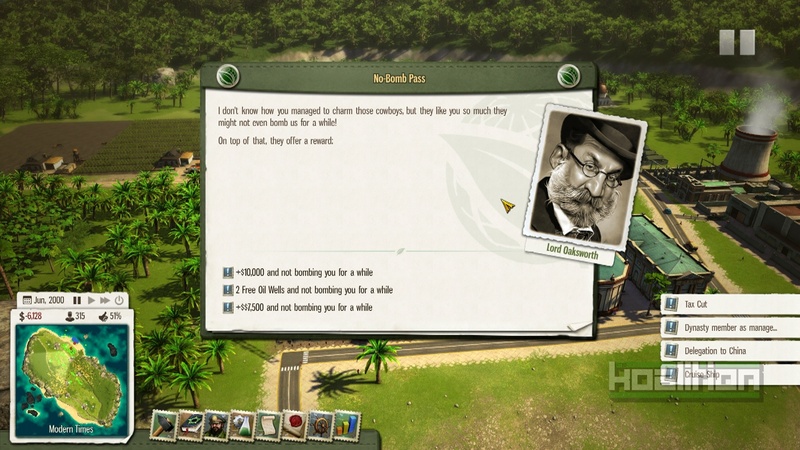 The story elements of Tropico 5 are a mixture between preset events and a form of emergent narrative that’s unique to this genre. The game is split into four different eras ranging from colonial times, where you run the country on behalf of the crown to the modern era where you independently run the country and need to survive through countless elections. But it’s not so straight forward as that. As the cover of the game clearly explains, you have a level of freedom here. You can play either as an oppressive dictator or an economical entrepreneur, bringing great wealth to your small island. Each role has its own opportunities and that’s something that Tropico 5 revels in. Opportunity. The way in which you develop your island has this sense of narrative to it. For instance, you might choose to elect the president’s son as the next leader. Then you might suddenly change the constitution, stop elections and create a military state. That’s not something the game forces. It’s something that emerges out of creativite play and it’s heavily encouraged. It’s something that makes the mechanics of building positioning, happiness levels and economics all that more interesting. In a more literal sense, Tropico 5 does have a campaign mode that takes you through the game and introduces you to a multitude of different characters that aid you as a leader. These characters really add to the charm that comes with recent Tropico games. The dialogue, whilst not always hilariously funny, always lightens the mood and creates an enjoyable experience. As I mentioned, Tropico 5 is all about opportunity. Mechanically, this means that the game offers many options in terms of how to run your island. With a simplistic UI the player selects various options in an attempt to gain your island’s favour and money. Placing buildings, managing the economy and researching new technologies are just a few of the things you’ll be doing over these long hours. It is undoubtably a slow game with very little actual action going on, but that’s a part of the appeal. You make significant changes and sit back and see how they play out. 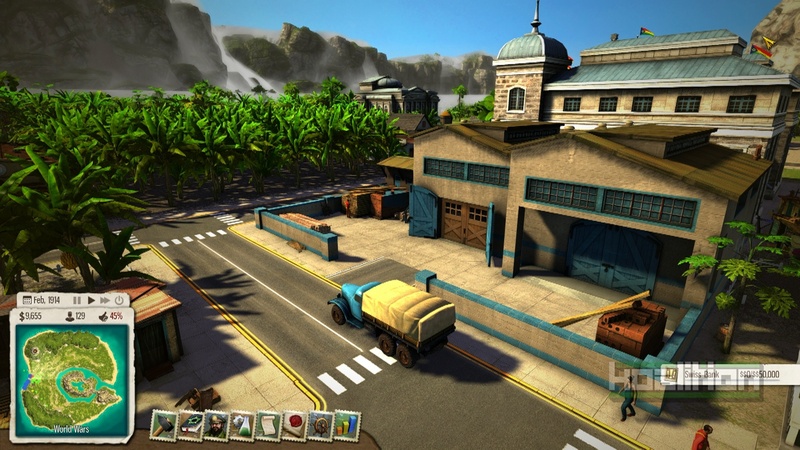 Tropico 5 has a variety of new features including new buildings, new research opportunities and more trade mechanics. However, the real change that’s going to draw players in are the eras. Four different stages that all have slightly different playstyles involved to succeed. The Colonial era will involve you creating a revolution and separating yourself from the British crown. Then, from there, you need to survive through the Wold War, Cold War and finally into the modern age. The subtle differences between each of these modes creates a new way to play each time as well as an objective, something that is really central to the Tropico 5 experience. However, these changes aren’t massively significant and I felt they could’ve done a lot more with it. It did change the way I played slightly in terms of what research goals to strive for and which countries I should ally with, but it never went beyond that. There was very little that I had to do differently in each era. I was hoping that maybe we had more significant scenarios involving what was going down at the time that increased the tension, but it was played very safe and missed out on this opportunity. 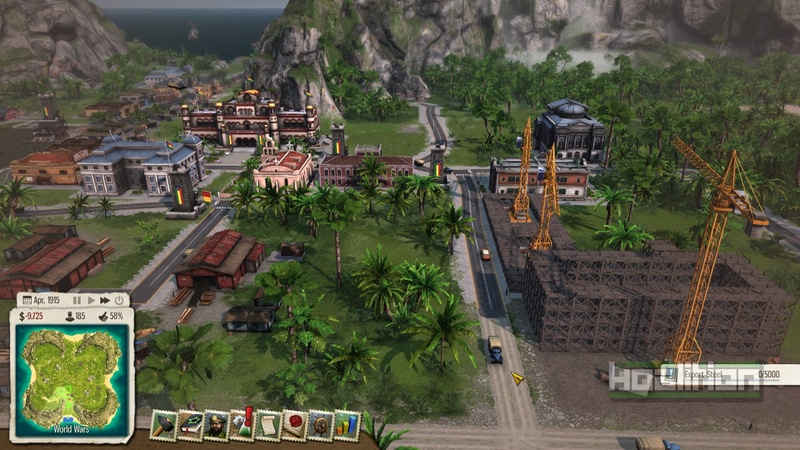 Tropico 5 looks truly beautiful. If you’ve been playing SimCity or any other city simulators, this will be a brilliant aesthetic change for you. This is a tropical island you’re building upon and no matter how much you industrialise, it’s still something that you can just sit back and enjoy looking at. It is really rewarding to just watch cars, trucks and pedestrians wandering around the city you’ve built and seeing ships sail off with your produce. The city building gives you the opportunity to create a personalised layout specific to how you want your island to look. However, when it comes to the finer details, it’s very very bland. Every house looks the same. Every skyscraper looks the same. There’s no personalisation on a finer level or any variety whatsoever. Speaking of lack of variety, that’s also the issue with the soundtrack. Yes, it makes sense that the tracks would be light and upbeat due to the setting, but that’s the case with the entire soundtrack. There’s nothing at all situational. When you accomplish something, when you’re being attacked, when you are in danger of losing the game, there is nothing in the audio that tries to create any tension and that’s something that really starts to get annoying later on. As the player, you want to feel like what you’re doing has some sort of effect and whilst this is displayed visually, it’s not display aurally. This, however, doesn’t ruin Tropico 5 and is just one of my largest complaints about an otherwise great game. You will be sinking hours upon hours into this game and replaying it constantly, just to try out different ways of running this island. Even if you’re not necessarily a big fan of city or political simulators, Tropico 5 offers an entry level experience that adds depth as you go along suiting it for any audience. This review was based on a digital copy of the game for the PC provided by Kalypso.